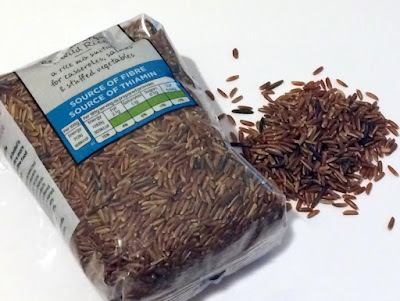 Camargue red rice is a variety of red rice that is cultivated in the wetlands of the Camargue region of southern France. Its outer red bran layer contains 95% of the minerals and dietary fiber of the whole rice which is made up of Iron, Zinc Potassium Sodium and Manganese. The Inner white portion contains carbohydrate and proteins. The rice is rich in fibre and has a lovely nutty taste. It can be used in salads and rice dishes. The rice needs plenty of washing before cooking, and it also takes longer to cook compared to white rice. Rich in fibre helping in digestion. Moong beans is a type of small, green legume that belong to the same plant family as peas and lentils. They are a high source of nutrients including: manganese, potassium, magnesium, folate, copper, zinc and various B vitamins. Like the Red Camargue rice, moong beans are great for the body as they too provide defence against, age-related diseases, heart disease, cancer, diabetes and obesity. Moong beans can be eaten raw, cooked, milled and ground into flour and also sprouted in salads. 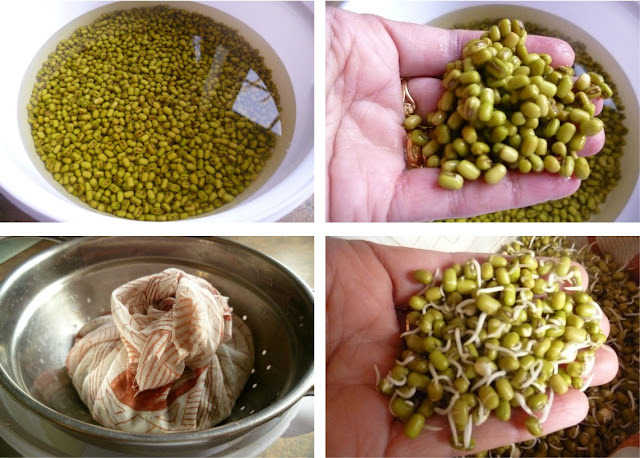 To sprout moong beans wash them in plenty of cold water and then drain them in a colander. Get a large muslin or cheesecloth and wring it in some clean water. Place the moong beans on the damp cloth and gather the edges up to form a parcel. Place the muslin parcel in the colander and place the colander in a dark cool place for 24 hours. After 24 hours you will find that they have sprouted. If you want longer sprouts you can sprinkle a few drops of water on the cloth and leave the beans for another 12 hours.You can freeze the sprouted moong beans to use at any time. This technique can be used to sprout any bean or lentil. 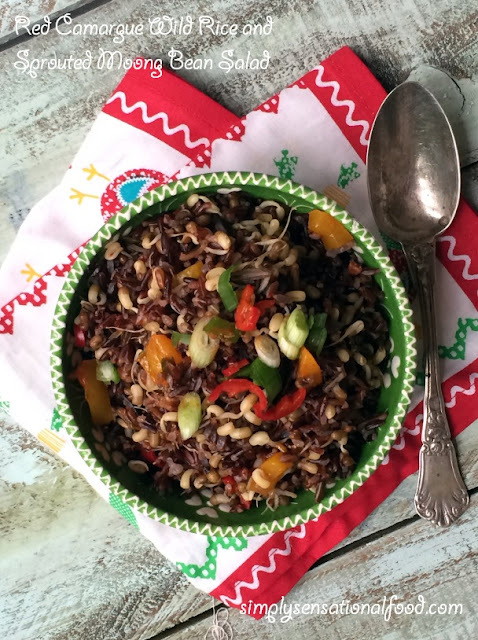 Nutty aromatic Red Camargue wild rice with healthy sprouted moong beans. 4 Spring Onion finely sliced whites and green parts. 1. Wash the rice in plenty of water and them soak it in clean water for about an hour.2. Drain the soaked water from the rice and transfer the rice to a large saucepan.Add 1 pint of water and bring the rice to boil, once its boiling bring it to a slow simmer and cook uncovered for 35 minutes or until rice is cooked.3. Drain the rice in a colander and once it is drained spread it out on a plate to cool.4. Place the sprouted moong beans in a microwave safe bowl add, 1 tablespoon of water and cover and cook on high for 4 minutes.5. Remove the cooked sprouted moong beans from the microwave and transfer them to a plate to cool down.6.In a sauce pan add the oil when its hot add the chopped spring onions, diced peppers, red chilli and saute the mixtute for 2-3 minutes. Add the salt, turmeric, chilli powder and lemon juice and mix into the mixture. Saute the mixture for 1 -2 more minutes and then transfer the mixture to a large bowl.7. To the onion and pepper mixture add the moong beans and the cooked rice and toss well. Transfer the salad to a serving bowl or dish. Salad can be eaten warm or cold. This sounds like a really interesting variety of rice to try. Thanks for the recipe idea! Delightful salad, Nayna! I love sprouted beans, and your recipe sounds inspired. Pinned for future reference. I am trying to substitute ingredients in my pantry for healthier ones like swapping white rice for brown and wholemeal pasta instead of normal. 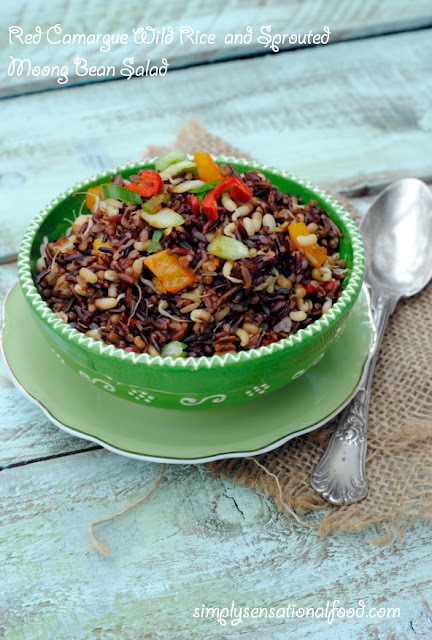 This looks delicious, i'd never heard of Red Camargue Wild Rice but I will order myself a bagful - love the look of this salad, perfect for warm summers days in the garden! What a beautiful colourful dish. I love everything that is going on in it. Its really easy to do and a lot cheaper than buying them ready sprouted.You ca use this technique to sprout chickpeas, lentils, black eyed beans. This looks so great. I need to make more things like this and be more experimental with my cooking. This looks really yummy and I would never thought to make something like this - thanks for the recipe! I have not tried camargue before but I bet it would make a refreshing change from normal white rice. Whats it like on the stomach? Its alot healthier than white rice, I find its really easy to digest nad stops me feeling hungry all the time. I love salads and am always looking out for new recipes. This is a delightful and healthy meal combined with sprouted moong. Now I know what to ask my new family from France to get for me. This looks lovely. Such a great combination of flavours and healthy ingredients. Kaz you can et both items in waitrose or in any large supermarket or Asian grocery store. A few months ago I wouldn't have dreamt of eating anything like this but having changed to clean eating I now know how good this would taste and I am finally enjoying food! This looks like a great recipe and really healthy, I should give it a go. Such a healthy one.. usually I add sone fresh and dry fruits with wild rice.. will try sprouts next time. I used to do a lot of sprouting but kind of forgotten about it. Really need to get back to it! I remember now - I got an error and couldn't comment. Can I FB you the comment instead. Nice salad Nayna. Stumbled, pinned and yummed. It looks so lovely and colourful. Very pretty! I haven't sprouted beans in far too long, so thanks for the reminder Nayna. I also haven't had red Camargue rice in a very long time. Your salad sounds delightful. Oh wow I've never tried that red rice but it's so striking! Must keep an eye out for that. This sounds lovely! 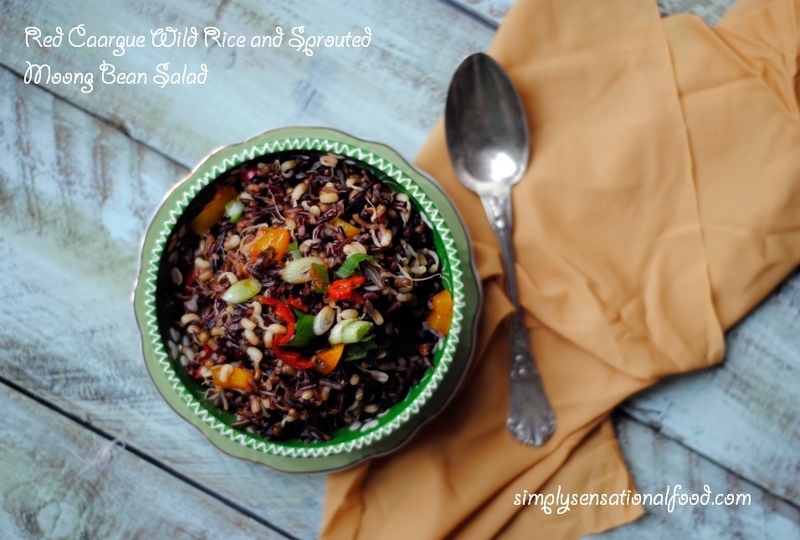 The nice nutty bit of wild rice is my favorite! I love any sort of salad, many times I've seen red rice in the aisles in some of the UK supermarkets but never bought any as I thought it takes too long to cook. After looking at the photo of your delicious salad certainly going to buy some red rice when I see it next. This dish looks healthy and delicious. Now that it's getting warmer, I will try and make a salad following your recipe.